Filling the gap between shared spreadsheets and IT-oriented development tools, Quick Base aims to let business users quickly create their own applications. Business users have lots of ideas for tools and add-ons that could improve daily operations — for instance, adding a workflow to an asset tracking application to govern how new assets are added into inventory. But with many IT departments caught up in initiatives around mobile, the IoT, cloud migration and other digital transformation efforts, it can be hard to get attention for day-to-day departmental workflow issues. “For our customers, particularly in middle-market and larger enterprises, the need they have for software is far outstripping the supply of IT and developer resources available,” says Jay Jamison, Quick Base senior vice president of strategy and product management. Quick Base is a low-code database and application development platform. 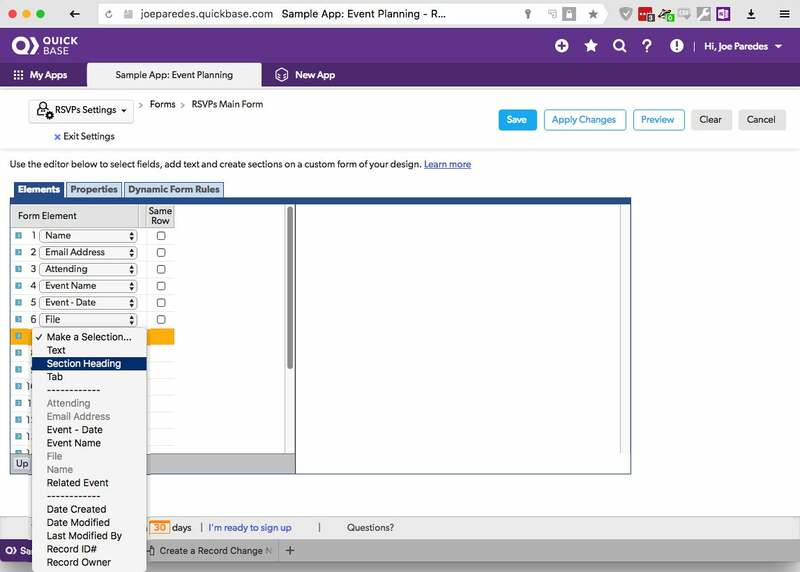 It lets teams work with a common data repository to build forms, create reports, set up workflows and automate processes. And its low-code capability enables non-developers, sometimes called “citizen developers,” to create applications without having to request time and attention from the IT department. Quick Base (at first called QuickBase, with no space) began as a startup in 1999 and was acquired by Intuit later that year. In 2016, it was sold to a private equity firm, and it has operated as an independent company since then. According to Jamison, the company has hundreds of thousands of active users, and more than 50 of the Fortune 100 use the product. Quick Base has three pricing levels. Premier, which costs $25/user/month when billed annually, enables 20-plus users to create up to 50 applications. The Platform level, at $40/user/month, starts at 40 users, allows up to 100 applications and adds features such as custom branding and corporate directory integration. The Enterprise level is a customized platform for each customer, with variable pricing. Quick Base’s appeal is partly based on its ease of use. “One reason people go to Quick Base,” says John Rymer, vice president and principal analyst at Forrester, “is that Quick Base is really designed for business people. The users are not developers, and yet they can fill needs using these tools. “There are other database tools out there,” Rymer continues, “but lots of them require you to know SQL. If you don’t know SQL but you still need to build database applications, Quick Base is one of the leading options.” Rymer cites FileMaker as Quick Base’s leading competitor in this area. In 2016, Quick Base commissioned Forrester to conduct a Total Economic Impact study on the implementation of the product. The study examined the effect of deploying Quick Base on a “composite organization” with annual revenue of $1.4 billion and 8,000 employees, with 10 citizen developers and 2,000 licensed users of QuickBase applications. Forrester found that the composite organization “saved an average of eight weeks of development time per application utilizing the QuickBase platform” and realized numerous cost benefits from having more applications available sooner with fewer IT staff. Another approach to collaboration, which other databases support as well, is the use of triggers. 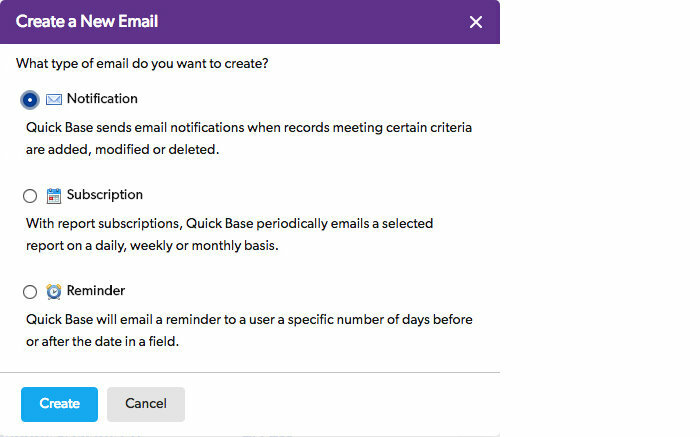 A change in a value in the database could result in a notification to a team member or the launch of a business process. 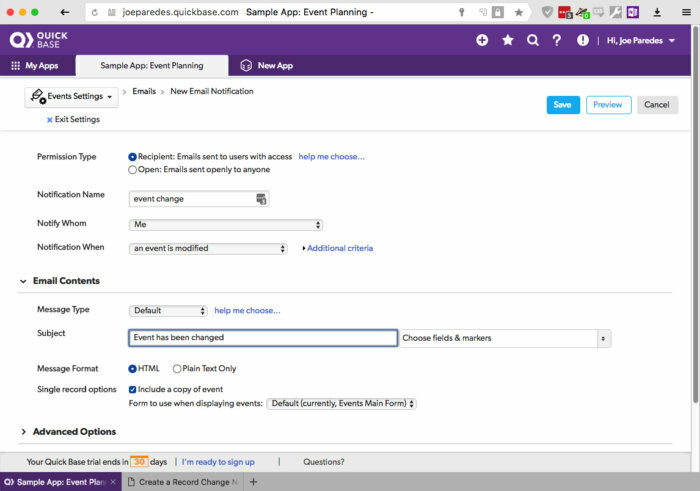 Quick Base has recently announced tools to automate those kinds of activities. Defining the type of email that will be sent when the data changes. For most of its history, Quick Base adoption has come from the bottom up, as someone in an enterprise realized they could streamline and automate their group’s processes. From there, it spread throughout the organization. The company is changing its approach, though, according to Jamison. “While we still love the grassroots, we don’t want to be shadow IT — we want to be a solution to shadow IT,” he says. To that end, Quick Base is working to add the kinds of management, security and integration features that enterprise IT demands. Jamison points to three priorities that define Quick Base’s strategy: trust, simplicity and power. “Trust is for building up the capabilities that professional IT organizations need,” he says. To that end, the company’s “single biggest investment,” he says, is in features such as user management and administration, auditing, governance, encryption, and integration with other applications and infrastructure. The simplicity and power aspects, on the other hand, focus on the needs of users. The former is about making the product more approachable by integrating training and tips and improving the mobile web interface. “On the power side, it really comes down to two core capabilities,” says Jamison. “One is around automation — being able to automate workflows or tasks so that Quick Base can take on more and more of their mundane aspects. Second is continuing to improve our integrations.” Quick Base becomes very powerful when it can be connected to disparate silos around an organization, he says, so that customers can build applications that bring in data from other systems, mash it up the way they want, and report it the way they want.